The new R&S NGL200 power supply series addresses users in the mobile communications and IoT sectors. Thanks to their high accuracy and fast load recovery time, the new R&S NGL200 power supplies are perfect for challenging applications in mobile communications and the internet of things (IoT). Their two-quadrant architecture allows them to function both as a source and a sink. Their short recovery times enable them to handle fast load changes that occur for example when a device switches from sleep mode to transmit mode. The new R&S NGL200 power supply series from Rohde & Schwarz specifically addresses users in the mobile communications and IoT sectors. The single-channel R&S NGL201 and the two-channel R&S NGL202 deliver up to 60 W of output power per channel. The output channels are floating, galvanically isolated and protected against overload and short circuits. The power supplies can sink power in a controlled manner, enabling them to simulate the specific characteristics of a battery. This series also sets new standards with its capacitive touchscreens and large, high-resolution displays. The optimized user interface is especially intuitive, and temperature-controlled fans ensure extremely quiet operation. Extensive safety functions safeguard the DUT and the power supply in the event of a fault. The R&S NGL200 power supplies feature linear regulation to deliver extremely stable output voltages and currents. This makes them the right choice for powering sensitive modules and for developing power amplifiers and MMICs. With up to 6 ½ digit resolution for voltage, current and power measurements, the R&S NGL200 series is ideal for characterizing devices that have low power consumption in standby mode and high current in full load operation. The entire measuring range is covered without having to switch ranges, speeding up measurements. In many cases, an additional digital multimeter is not necessary. This saves space and money and simplifies test setups. Developers and engineers worldwide have been relying on the test and measurement expertise of Rohde & Schwarz for more than 80 years. Known for its innovative strength in performance testing solutions, Rohde & Schwarz is applying this competence with the same quality standards to its entry class equipment. 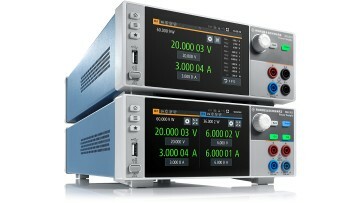 With the strategic goal of becoming a full portfolio supplier in the test and measurement market, the company is building an industry-defining portfolio of bench instruments, ranging from oscilloscopes, DC power supplies and signal generators to spectrum analyzers, vector network analyzers, meters and counters. For this growing product range, Rohde & Schwarz is extending its reach through a new distribution network with channel partners worldwide, offering a one-stop shop experience for any type of test and measurement task, application need and budget. Whether in the lab or field, on campus or in a production facility, Rohde & Schwarz demonstrates that high-quality hardware and software solutions do not have to come with a high price tag.